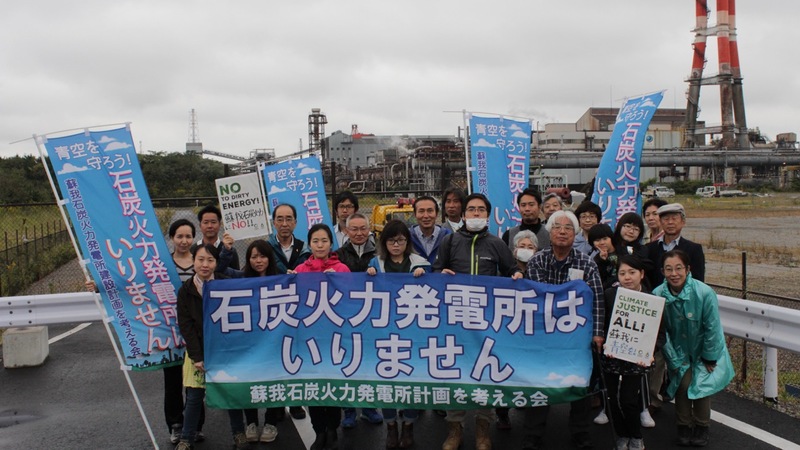 Friends of the Earth Japan raised voice with local communities in Soga, Chiba against the construction of new coal power plant as a part of the global fight against climate change, joining with over 30 grassroots groups across six continents. 13-14 October saw a wave of mobilization across the world such as giant murals of resistance in Spain, anti-coal mobilizations in Japan and Indonesia, actions with Sherpas highlighting climate impacts in Nepal, work with gas-affected communities in rural Mozambique and an anti-fracking rally with inflatable dinosaurs in the UK. The residents of Chiba city in Chiba Prefecture have suffered from serious pollution caused by the smoke from the factories of Kawasaki Steel Corporation (now JFE Steel) since its creation in 1951. In 1972, citizens from a wide range of backgrounds including parents, administrative officials, school teachers and doctors seeking measures to prevent pollution gathered to form the “Organization to Eliminate Pollution from Chiba City”. At the time, 75,000 residents of Chiba city which constitutes to twenty-percent of the population came to an agreement and requested for a “Pollution Prevention Ordinance” but it was dismissed. The residents then filed suit in the hopes of ensuring “blue skies for all children” and the Aozora Trials began in 1975. In 1988, the Chiba District Court legally recognized the causal relationship between the air pollution by Kawasaki Steel and the health hazards of the residents. As a result, the court ordered the Kawasaki Steel Corporation to pay damages and ruled in favor of the plaintiff. This legal recognition of the causal relationship between the air pollution and the public health hazard encouraged future air pollution trials in other areas. Residents in Chiba with such previous battles against air pollution are now confronted with the construction of a new coal power plant right in their beloved city, threatening those blue skies once again. Currently, a construction plan of a new coal power plant facility with a capacity of 1,070,000 kW is underway in Chuo ward of Chiba prefecture (the tentative name is “Soga Coal Power Station”). This power plant will be operated by Chiba Power Company Ltd., a company whose investors include the JFE Steel (formerly Kawasaki Steel) and Chugoku Electric Power Co. As of now, the construction plans are being assessed for environmental impacts based on the Environmental Impact Assessment Laws. Even now, local residents suffer from the air pollution that was thought to be caused by the JFE Steel East Japan Works and as such are showing strong concerns over the prospect of further increase in pollution emissions. The industrial complex in Chiba city. Coals and slags are piled outside without cover. According to a survey by the citizens group “Association to consider the Soga Coal Power Plant Construction”, the City Office still receives complaints over black dust from residents such as “the screen door and clothes pins are still black and sticky even when wiped down everyday”. In another resident survey conducted by the same association, ninety-percent of those who answered the survey opposed the construction of a new power plant (300 out of 10,000 responded to the survey). JFE Steel, a company with a history of causing pollution, is an investor of this new power plant. The residents are calling for the company to first improve the current situation. Public facilities such as schools and athletic grounds are located within a 5km radius of the planned construction site. If a coal power plant is constructed and begins operations, additional concerns will be raised on the effects of air pollution on local residents. The planned construction site is in an area which experience environmental improvement after the court rulings during the Aozora Trials. After such victory and consequential improvement, there is a possibility that this land may be contaminated again with pollution if the new coal power plant is constructed. Coal power plants emit the most amount of CO2 among other fossil fuels even if more efficient technology is used. There emissions are about twice that of LNG (liquefied natural gas). As such, it is a major contributor of global warming, accelerating climate change such as abnormal weather, torrential rain, and droughts. As the international community is increasingly moving away from coal and as power demands in Japan is expected to decline in the future, does Japan really need another coal power plant? Previous No to Rampal coal plant!